These bed sheets are specially designed to fit the standard size Homecare Bed mattresses (36"X80"). Finding these in the store can be a difficult task at times and still may not be the right fit. We offer these as well as the extended version for the longer 84" mattresses in special cases. They come in a pack of 2 and can be washed like you normal sheets. 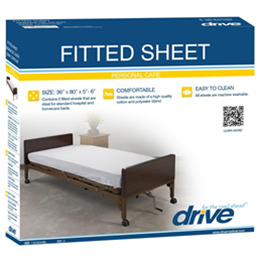 Features and Benefits-Designed to fit the 36"X80" standard mattresses-Comfortable and durable-Easy maintenance-Made specifically for Manual, Semi, or Fully Electric Homecare Bed Mattresses-Sheets are made of a high quality cotton and polyester blend.